In most states, you only have six weeks to make a decision on an individual health insurance or Affordable Care Act (ACA) exchanges plan. You can sign up for health insurance on your state's health insurance exchange or individual marketplace only during an annual open enrollment period, unless you have a "qualifying life event," such as getting married or having a baby. If you buy health insurance through your workplace, your employer will inform you about its open enrollment period. The information below is for people buying health insurance on their own. Here's what you need to know for the open enrollment period for 2019 individual and family health insurance plans. Open enrollment starts Nov. 1, 2018, and continues through Dec. 15, 2018 in most states. Your coverage would start on Jan. 1, 2019. If you buy after the Dec. 15 date in the states that are extending the enrollment period, you'll need to check to see when the coverage will start as most still require you to obtain your plan by Dec. 15 for it to start on Jan. 1, 2018. If you buy after Dec. 15 your plan's start date may be Feb. 1 or March 1, 2019. No matter how long you have in your area, it's important to not delay in choosing a plan once open enrollment starts. People who qualify for Medicaid or the Children's Health Insurance Program (CHIP) can enroll at any time of the year. These are state-federal programs for people with limited incomes or disabilities. The ACA required nearly all Americans to have health insurance. However, Congress decided in 2017 to eliminate the individual mandate penalty. So, though the individual mandate is technically still on the books, the penalty is not. You won't get whacked at tax time if you don't have health insurance. Of course, it's usually a good idea to have health insurance, so be careful about dropping coverage because the government doesn't require it any longer. Take time to read the notice to see what it means for you. Make certain your doctors and preferred hospital are still in your network. Be aware, you may be able to use out-of-network doctors and hospitals, if you're willing to pay more. In some cases, you might not be covered at all if you go out of network. Your prescription drug coverage also could change. The plan may no longer cover the drugs you take to manage your chronic conditions. It's important that you check your plan's drug benefits for 2019 before you allow it to renew. You may need to find a different plan for your needs and now's the time to do it. If you qualify for employer-sponsored health insurance, you will likely want to buy health insurance through your employer. Individual insurance usually costs more than employer-sponsored plans. Open enrollment is not for auto, life insurance or long-term care insurance. Those are completely separate products that you can buy on your own any time of year. It's also not for Medicare. The fall open enrollment period for Medicare is Oct. 15 to Dec. 7, 2018. If you miss open enrollment for the health insurance exchange, you won't be able to sign up for coverage unless you qualify for a special enrollment period. Here's what might trigger a special enrollment period: divorce, marriage, birth or adoption of a child, death of a spouse or partner that leaves you without health insurance, your spouse or partner who has you covered loses his/her job and health insurance, you lose your job and with it your health insurance, your hours are cut making you ineligible for your employer's health insurance plan, or you are in an HMO and move outside its coverage area. Bronze plans have the highest deductibles and other cost-sharing, meaning more spent out of pocket for you when you use healthcare services, Fredericks says. Silver plans have lower cost-sharing than bronze and gold plans even lower than silver. Platinum plans have the lowest deductibles and copays, etc. Which plan is right for you depends on how much you'll need healthcare in 2019. If you go to doctors frequently to help manage a chronic condition, you likely want a plan with lower copays and deductibles. If you're pretty healthy, you may be better off signing up for a plan with lower premiums but higher costs when you use your insurance. Of course, it's a gamble, because you never know what's going to happen, Fredericks says. When it comes to bronze plans, Fredericks' advice: "Caveat emptor." (Buyer beware.) Once you sign up for a level of coverage, you are locked into that level for the year. If you choose a bronze plan and discover you need surgery, you can't change to a plan with a lower deductible. After years of skyrocketing premiums, ACA plan member costs will actually decrease for many plans. The exact premium you pay depends on factors, including income, your state and the plan type. The Centers for Medicare and Medicaid Services said ACA federal exchange plans will on average see premiums drop for the first time since the ACA. The average for the second-lowest cost silver plan premium will decrease 1.5 percent in 2019. The lower premiums are likely connected to insurance companies overcharging premiums the past two years. Insurers have felt much upheaval in the market, including Congress attempting to kill the ACA and the White House complaining about the ACA exchanges. However, after weathering that storm, insurance companies in the ACA marketplace are making money. Hence, they are decreasing premiums in some areas. Not all plans will be cheaper, so it's still important to shop around to find the right plan for you. The level of coverage for these services can vary. All the plans in the marketplace must provide consumers with a brief, understandable description of what they cover and how their plan works. The Summary of Benefits and Coverage (SBC) must be posted on the plan's website. Check out the SBCs for the different plans you are considering. This is a good way to compare plans and benefits. Americans will have another coverage option in 2019. The Trump administration is opening up short-term health plans to all people. The ACA limited short-term plans, also called catastrophic plans, to young people or those who couldn't afford any other coverage. However, the short-term plans will be available to all. Short-term plans have low premiums, so you pay little upfront. However, if you need healthcare services, a short-term plan might provide little coverage. In fact, a short-term plan doesn't have to follow the ACA's 10 essential health benefits. That means they're not required to cover pregnancy and newborn care, prescription drugs and the eight other benefits. You may find a short-term plan that covers some or all of those benefits. Those plans will likely cost more than a regular bare-bones short-term plan. A short-term plan will likely have fewer out-of-pocket protections. If you go with a short-term plan, you have to hope for a healthy year or you might wind up with large health bills. Short-term plans are technically not considered health insurance, but they are an alternative if you find other coverage is too expensive. One last piece about short-term plans: you can now keep a short-term plan for a year and renew them twice. In effect, that means short-term plans can now last three years. These extensions from previous regulations gives short-term plans a more even playing with regular health insurance. However, beware of short-term plan limitations before deciding on one of those plans. 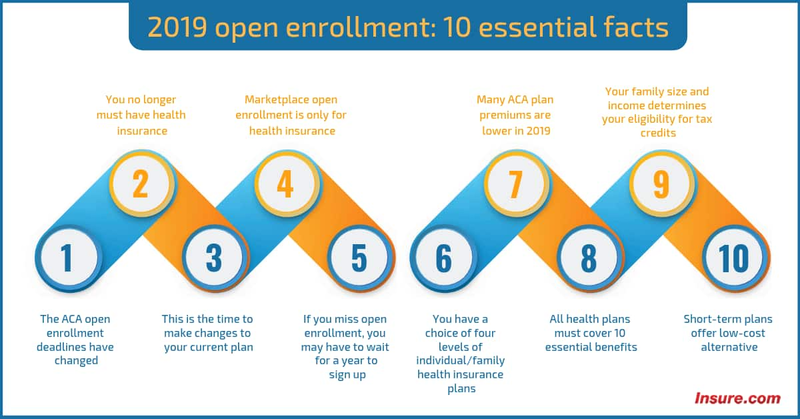 1 Responses to "2019 open enrollment: 10 essential facts"
I missed the cut off window. So losing insurance through a job loss counts as special enrollment, but what if I just got a full time position and didn't qualify for health insurance until now? Does that count as special circumstance?